United Nations Secretary-General António Guterres on Monday deplored and condemned the ongoing violence against civilians, including against students, in Nicaragua. Speaking on behalf of Mr. Guterres at the UN Headquarters, Deputy Spokesman Farhan Haq told reporters that “the use of lethal force is not only unacceptable but is also in itself an obstacle to obtaining a political solution to the current crisis”. According to media reports, at least 10 people were shot dead in Nicaragua on Sunday as police and paramilitary groups supporting the government, sought to remove roadblocks set up by anti-government demonstrators, who have been demanding that President Daniel Ortega step down. The current wave of anti-government protests began following the announcement of changes to Nicaragua's pension system on 18 April, which have since been scrapped. The government says that the protesters are attempting to stage a coup d’etat against the administration of Mr. Ortega. It recently launched “Operation Clean-up” to try to remove the barricades and retake full control of urban areas. Hundreds have been reportedly killed since the protests began. Earlier this month, Zeid Ra’ad Al Hussein, the UN High Commissioner for Human Rights, called on the Nicaraguan authorities to “take real steps” to prevent further loss of life in the country. 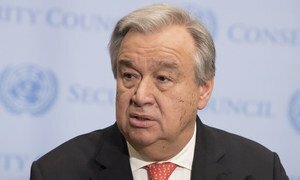 Deeply concerned about the continuing and intensifying violence in Nicaragua, United Nations Secretary-General António Guterres on Wednesday deplored the loss of life in the protests and the attack against Catholic Church mediators in the National Dialogue.